Ecuador is a fantastic country to teach English. 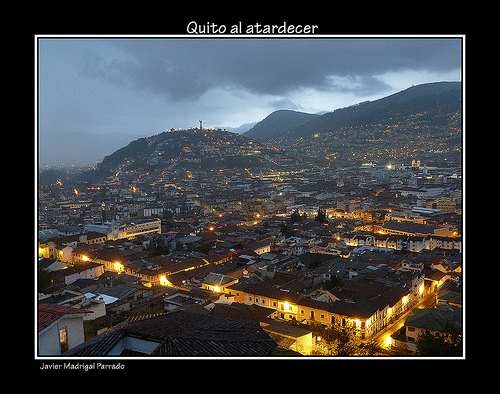 I was only in Quito for about three months but the way of life and the enthisiastic students made a real impact on me. If you're thinking of heading out to Ecuador then have a look at this blog I've written for i-to-i titled 8 things you didn't know about teaching English in Ecuador. This article gives you a few tips on what to expect while in Ecuador and how you can improve your stay there. It wasn't all fun and games in Ecuador though. I had a few problems, mainly because I was out on my own late at night. Have a look at this blog about the Cons of tefling in Ecuador. Ecuador seems to be a popular destination for TEFL teachers at the moment. A few people have written to me asking about visas. The main problem is that the authorities are becoming a lot stricter about who they are giving visas to. So before you go make sure you've done your research. Anyone looking to go out to Ecuador at the moment? I´d be interested to hear from you if you're living out there now. Drop me a comment below. Thanks.